Cold Dude Computers: Club Penguin Band 'Anchors Aweigh' Single! 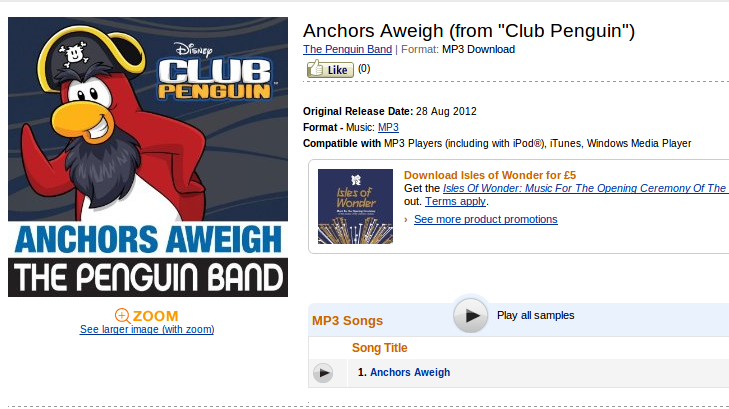 Club Penguin Band 'Anchors Aweigh' Single! Recently Club Penguin released a new sneak peek of a song on Amazon Music! 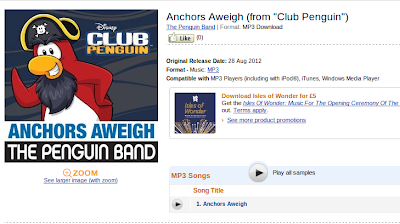 The song is called 'Anchors Aweigh' and it is preformed by the Penguin Band. The original release date of the song was going to be on the 28th but now it will be on the 26th. The song will be 2 minutes and 22 seconds, there is a 30 second preview on the the page! This song is very catchy, I wonder who is voicing the PB? The song will also be sold for £0.89. Have you heard the preview yet? Leave a comment and let us know!